Five Guys Burgers and Fries (Five Guys) is continuing to gain ground and fans across the country, according to a new survey from Market Force Information, a worldwide leader in customer intelligence solutions. In a quick-service restaurant (QSR) industry survey of more than 7,600 U.S. consumers, Market Force found that Five Guys is their favorite burger chain. Five Guys earned the No. 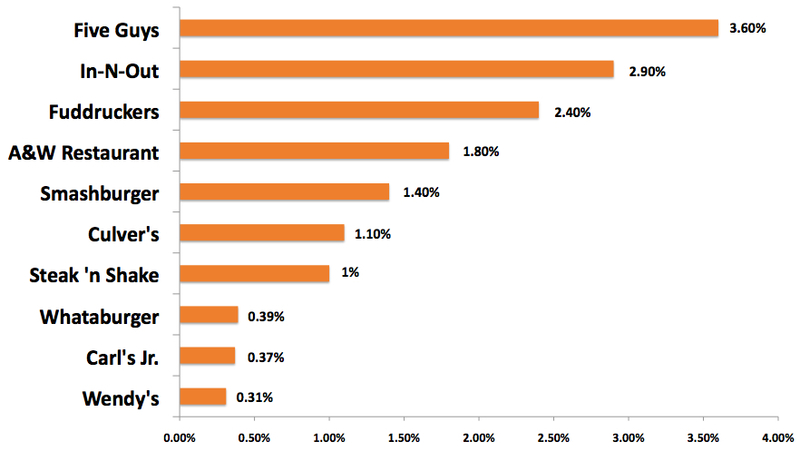 1 spot in the Market Force study. The results proved consistent with the brand’s rapid growth, as well as the popularity of its food and atmosphere. West Coast favorite In-N-Out Burger, which is also known for having passionate patrons and strong word-of-mouth buzz, ranked second among consumers. Rounding out the top five were Fuddruckers, A&W and relative-newcomer Smashburger. See Graph 1. This set of research is the first in a series of findings from a study that evaluated consumer preferences across six QSR restaurant categories. Market Force first calculated the favorites based on pure number of votes, and then factored in the number of locations for each chain for a more level view of the results. The results were also analyzed geographically to see which chains are most popular in various regions of the country, including Northeast, Midwest, South and West. When Market Force looked at the results to determine how the burger brands fared in four different regions of the country, Five Guys still dominated, ranking first place in all of the regions. 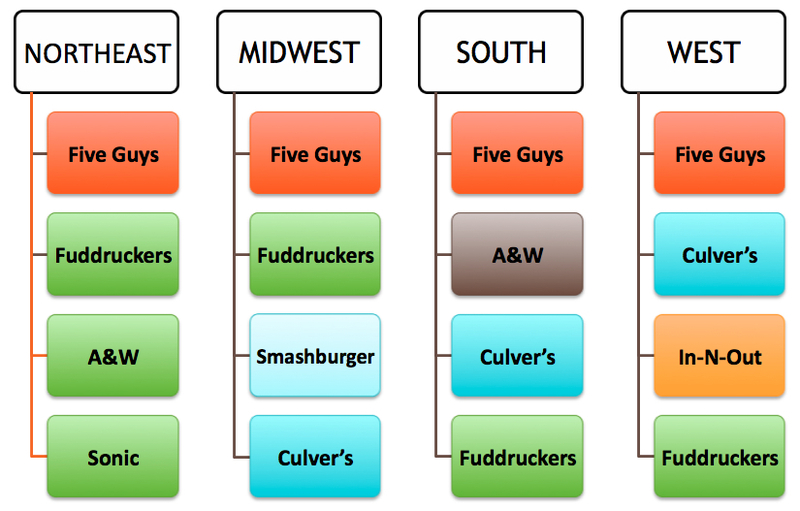 From there, the regional leaders diverged, although Fuddruckers, a relatively small chain, placed in the top four across all regions. See Graph 2. The survey was conducted in August 2012 across the United States. The pool of 7,600 respondents reflected a broad spectrum of income levels, with half reporting household incomes of more than $50,000 a year. Respondents’ ages ranged from 19 to over 65. Approximately one-quarter were men and 75% were women, and 73% reported working full or part time. Half of the respondents have children at home and more than two-thirds are married. Click here for more information on Market Force’s customer intelligence solutions for the restaurant industry.